Kevin Hart Roasts Lil Pump & Lil Xan For Their Face Tattoos During VMA Speech - Pop It Records - NEW MUSIC EVERYDAY! 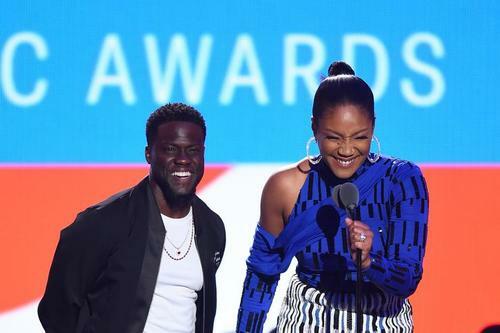 During Monday night’s Video Music Awards, Kevin Hart & fellow Night School co-star Tiffany Haddish opened up the night’s event with a little comedic relief. From poking fun at DJ Khaled & the Jersey Shore to making fun of celebrity engagements & mispronouncing Camila Cabello’s name, Hart & Haddish tried to get a rise out the crowd with a nice roast session, but arguably the best dig was saved for Lil Pump & Lil Xan. Kevin Hart decided to make fun of Pump & Lil Xan for having face tattoos, saying they’ll never get a job in the real world if music doesn't work out. After the shot, the camera pans over to Lil Xan, who appeared to be laughing it off as his newly announced girlfriend, Noah Cyrus, playfully hugs him and laughs along as well. Looks like Xan was being a good sport, but who know about Lil Pump? Check out Hart’s shot (below) and let us know your thoughts in the comments.